In Windows phone, there is no official app of Google Maps provided by google for windows phone. But Some third party apps are available on windows phone store for google maps. Early the windows phone browser doesn’t support the google maps. Now you can use google maps by a browser or a third party app. 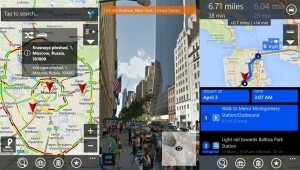 gMaps is a free app for google maps on windows phone. Also available paid version of this app for removing the ads. This app Provided many features. This is not an official app of google. Find the location on the map and track speed. Support Layers like Street, Satellite, Traffic etc. Directions using Car, Bicycle, Public or walk. Share map by SMS, email. Download gMaps app from Here. Turn by turn navigation is not available in this app. You can use Here Drive+ for this feature. Go to www.maps.google.com From your browser (Internet Explorer). And give the permission to access your location. Also, you don’t get turn by turn navigation in maps. A better option is you will use an app for better performance because it is slow.